emotional excess. – static confusion. 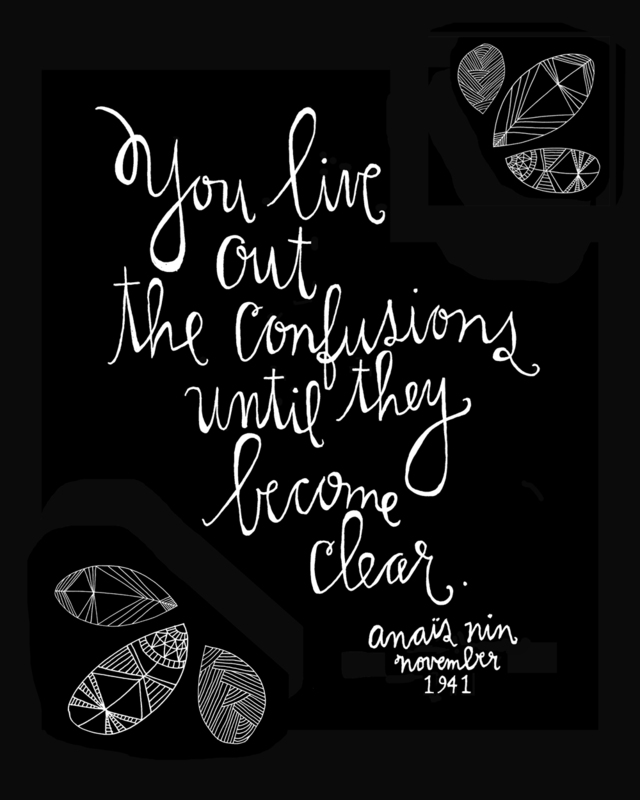 anais nin continues to be a saving grace for me. her profound wisdom somewhat like a bucket of ice water splashed onto my face. her words perfectly confronting and comforting. there is a brave honesty with how she thinks and writes. for some reason, i needed to be reminded of that. life, love and writing. my tripod of pleasure that i’ve become feverishly anxious about it seems. so i read on. as someone who ebbs and flows through life (fundamental characteristic of an aeries pixie) i can relate to such personal intensification–emotional temperature boiling until the mental thermostat cracks. and when it does it is usually a mess. for myself and the other person who came at its expense. this happened the other day–my unhappy convolutions inflicted upon someone else–a dear friend none the less. like the words of anais nin’s words, the hurt in her face was a cold splash to the face. it was time to breathe and let all the excess out. a consequence for people who are emotionally excessive is that we tend to think that it is a bad thing. but as i’ve learned in reading this piece about nin’s diaries i understand that it is about expression, of being … of living. and just in this moment i realize that my current discomfort is not because of a lack of life, love or writing. quite the contrary–there is so much of it in me right now that i just need to allot the time for it. to let the emotion flow and overflow. i like to live always at the beginnings of life, not at their end […] i am by nature always beginning and believing […] older people fall into rigid patterns. curiosity, risk, exploration are forgotten by them […] one has not yet discovered that she has a lot to give, and that the more one gives the more riches she will find in herself […] each time you write a story you give away one of your dreams … this dream is then planted in others, others begin to live it too, it is shared, it is the beginning of friendship and love. i’m emotionally excessive; unapologetically so. but that’s ok because something great is surely to come of it. for all excess embodies success. even in moments of enduring new beginnings. Previous Post j’aime montreal … très beaucoup.